Description: Pack-in game that came with US Colecovision console. PLAYS, SOUNDS AND SCORES JUST LIKE THE ARCADE GAME! Donkey Kong.the ape has stolen Mario's girlfriend and has taken her to the top of a steel fortress.Mario must get to the top to save her! Use the joystick control to manoeuvre Mario across the girders and up the ladders. BUT-as he runs, the ape throws barrels at him to prevent his progress. Use the fire button to get Mario to jump over the barrels.Will Mario make it to the top and rescue his girl in time? 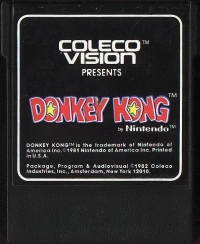 08-28-2018 aliensstudios Box Text DONKEY KONG by Nintendo VIDEO GAME CARTRIDGE FOR USE WITH COLECOVISION VIDEO GAME SYSTEM PLAYS, SOUNDS AND SCORES JUST LIKE THE ARCADE GAME! 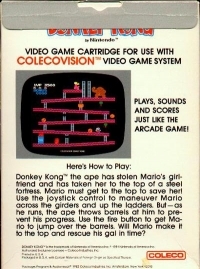 Here’s How To Play: Donkey Kong.the ape has stolen Mario's girlfriend and has taken her to the top of a steel fortress.Mario must get to the top to save her! Use the joystick control to manoeuvre Mario across the girders and up the ladders. BUT-as he runs, the ape throws barrels at him to prevent his progress. Use the fire button to get Mario to jump over the barrels.Will Mario make it to the top and rescue his girl in time? 01-18-2012 jeffsgames Description Pack-in game that came with US Colecovision console. 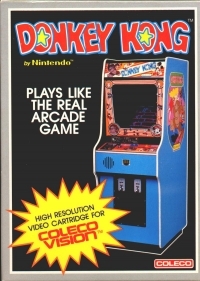 This is a list of VGCollect users who have Donkey Kong in their Collection. This is a list of VGCollect users who have Donkey Kong in their Sell List. This is a list of VGCollect users who have Donkey Kong in their Wish List.